One of Chopin's most famous pieces, Nocturne No. 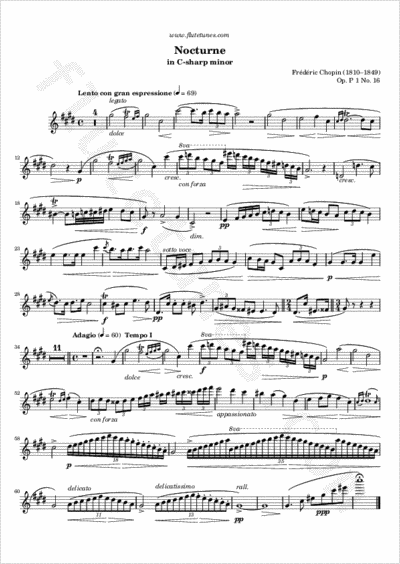 20 in C-sharp minor was written by the Polish composer for his older sister, with the statement: “To my sister Ludwika as an exercise before beginning the study of my second Concerto”. It was only published 26 years after the composer's death, and is now often referred to as “Lento con gran espressione”, from its tempo marking. It has been featured in a number of movies and TV series. Many thanks to Lily for contributing the present arrangement for flute and piano!